Over one third of Singapore’s population is Buddhist, so it’s no surprise that Buddhist temples are scattered across the island. Most of these traditional small to medium sized temples lie in Singapore’s suburban neighbourhoods and have been around for a long time, with the oldest one, Thian Hock Keng Temple, dating back all the way to 1920. 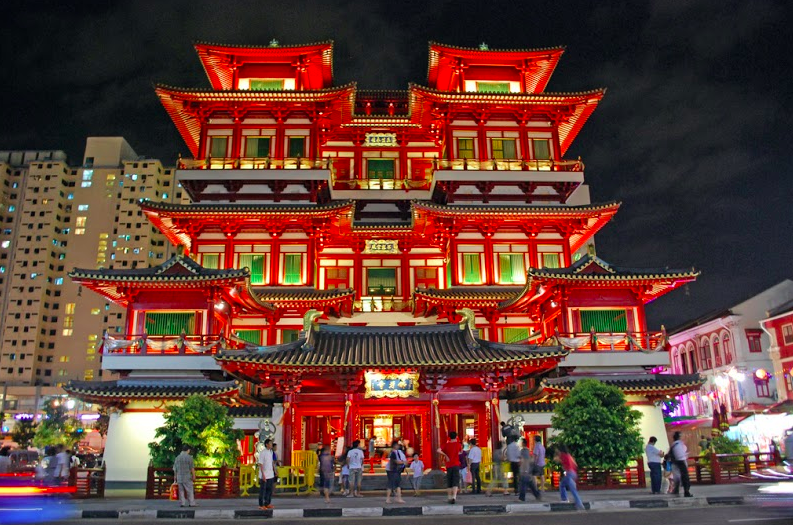 However, one of the most famous is not an old one but a recent addition to Singapore’s heritage Chinatown district: the Buddha Tooth Relic Temple and Museum. From the outside, the temple still looks like a traditional imperial Chinese building with its slanting bamboo roofs and red wooden beams. The complex is influenced by architectural styles from the Tang dynasty. On the inside, you’ll see that this $75 million complex built in 2007 enjoys air conditioning, lifts and TV screens. 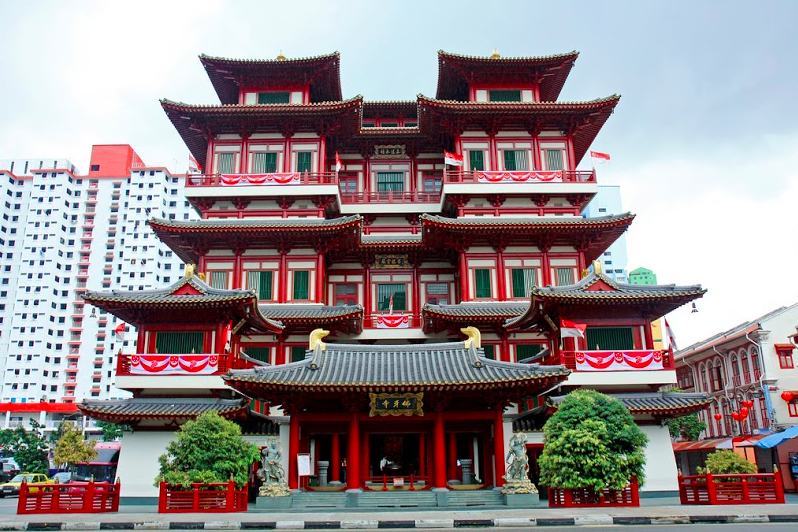 The Buddha Tooth Relic Temple is one of Singapore’s most popular spiritual hubs for Buddhists because it houses what is claimed to be Buddha’s left canine tooth. It is also a museum attracting over 3.6 million visitors from all religions annually looking to learn more about the history, art and culture of Buddhism. If you have a bit of extra time, why not explore a little more with our Chinatown neighbourhood guide! On the 4th floor of the Buddha Tooth Relic Temple lies their centrepiece: a left canine tooth believed to belong to the actual Gautama Buddha. Supposedly recovered from his funeral pyre in northern India, the tooth relic is now housed in a giant stupa weighing 3.5 tonnes and made from 320kg of real gold. As only monks are allowed into the actual relic chamber, you won’t be able to see the tooth. You will only get to see the golden stupa and a live video streaming of the tooth from behind a glass wall. At the temple’s main entrance sits a magnificent 15-foot golden Buddha that was carved from a single wood log and then hand painted using grounded natural stones and vegetable dyes. 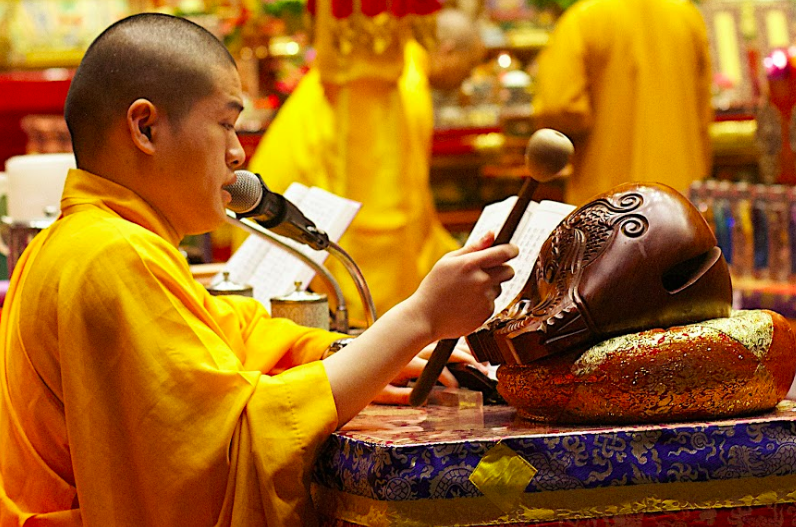 Monks and devotees pray and chant sutras in this chamber- see the daily schedule for prayer rituals. 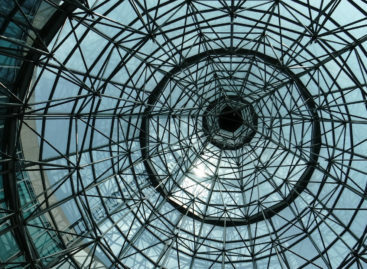 If you appreciate interesting architecture, check out our article on strange buildings in Singapore! The beautiful orchid-filled rooftop garden is famous for its “10,000 Buddha Pavilion” housing a large prayer wheel, which is a rotating cylindrical book shelf engraved with Buddhist scriptures. Here, you’ll see Buddhists reciting mantras while walking in circles to turn the prayer wheel. Each full circle triggers the wheel to ring a bell and is believed to help Buddhists accumulate wisdom, merit and purify bad karma. 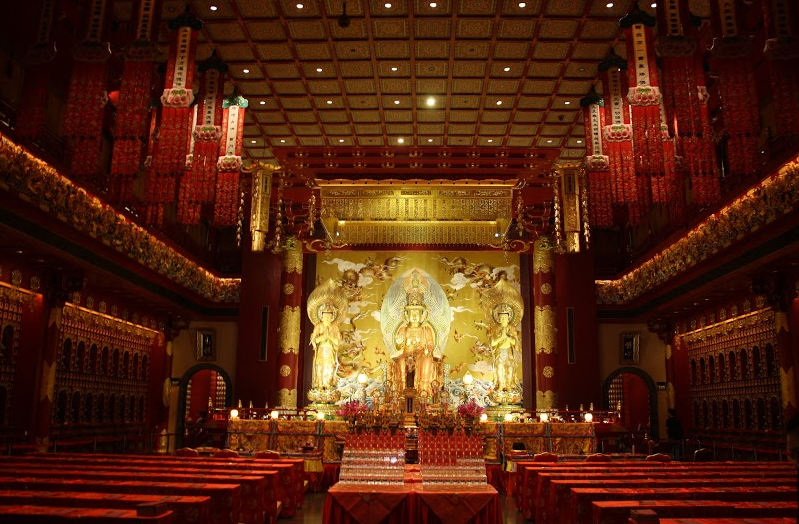 As with most Buddhist temples, the Buddha Tooth Relic Temple serves vegetarian meals free-of-charge to monks and visitors in the basement dining hall. According to Buddhist teachings, one must accept this food in order to complete the karma of Buddha. To learn more about the history and culture of Buddhism, head to the third floor museum to see donated Buddhist statues and artefacts from all over the world. You can also see sacred relics of other parts of Buddha, including his nose, brain and eyes. Between the first and second floors is a mezzanine which is designed like a balcony overlooking the first floor. Not many know about this in-between floor, but it is a must-see as it offers a breathtaking view of the 15-foot Buddha statue in the main chamber below. Dress modestly. Wear long pants or skirts that fall below the knees, and tops that cover the shoulders. You can also borrow the temple’s robes placed at the two entrances of the temple. 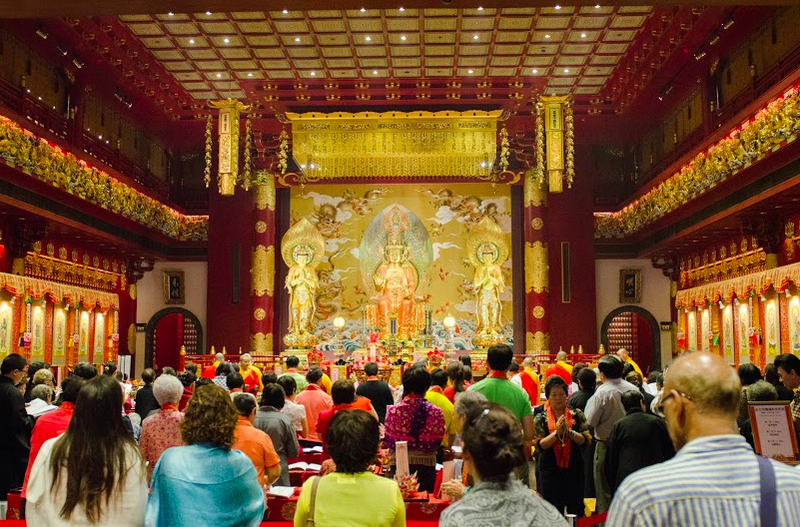 Flash photography is not allowed in the Buddha Tooth Relic Temple, except in the 4th floor relic chamber. Take your shoes off on the 4th floor before entering the tooth relic chamber. Don’t bring pets or non-vegetarian foods into the temple. 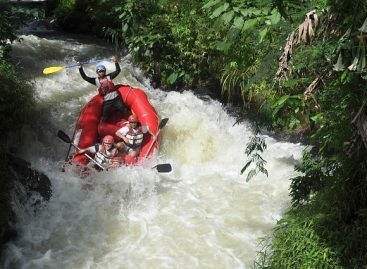 Admission Charges: Free, donations are welcome. From the outside, the temple still looks like a traditional imperial Chinese building with its slanting bamboo roofs and red wooden beams, as the complex is influenced by architectural styles from the Tang dynasty.